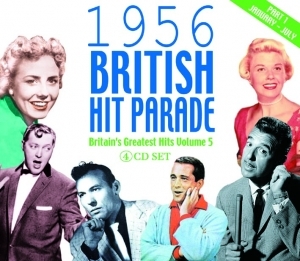 This series continues to build an historic collection of the development of British chart music. 1956 was the year when the chart was expanded to 30 places and means that our collection is presented as two separate 4 CD sets. 1956 was the year that Rock and Roll really began to make its presence felt and the track listing demonstrates the eclectic nature of the music industry at the time, Where else would you find the old guard of established stars such as Frank Sinatra, Bing Crosby and Edmund Hockeridge rubbing shoulders with the new upstarts who were to go on and dominate the charts such as Elvis Presley, Gene Vincent, Little Richard and Carl Perkins. Added to this there are a number of typically British entries, most notably the Goons who were establishing themselves as one of the most loved and important icons of British entertainment. The package is completed with a fully illustrated booklet which tells the story of every song and every artist in detail.